Eason’s work on Kafka is similarly detailed, with intricate, geometric ink drawings of beards and bug shells and scary monsters. The haunting black-and-white sketches paired with Roth’s elegant verses do justice to the sense of foreboding Kafka was so good at crafting. It’s the kind of book that might be scarier for adults than for the actual children. My First Kafka: Runaways, Rodents, and Giant Bugs, a book made more marvelous by London-based Rohan Daniel Eason’s fine macabre black-and-white illustrations. 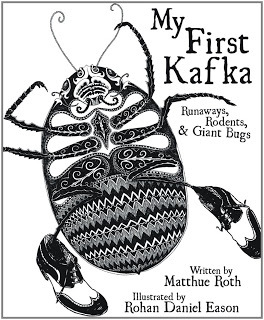 Somehow, Roth and Eason found a way to make Kafka appropriate for kiddo audiences. The book is slim, exquisitely illustrated in crisp black and white by Rohan Daniel Eason. Eason shows keen judgment, imbuing his illustrations with enough appeal and geniality to allay any fears while retaining a creeping, hardly perceptible sense of the macabre.